Moira Gaul, M.P.H. | January 18, 2019. Science displays majesty in Alexander Tsiaras’ “From Conception to Birth Visualization” shared during his 2010 TED Talk. Through magnificent artistry and scientific genius, Tsiaras’ visualization embodies this year’s March for Life theme – Unique from Day One: Pro-life is Pro-science. The presentation depicts the indisputable science of the beginning of human life through its nine-month progression to birth. Fertilization takes place upon the fusion of a woman’s oocyte/egg and a man’s sperm, begetting a distinct new member of the human race with blueprints for every organ, system, and specialized cell in the body. Tsiaras, an artist, technologist and former Yale University Medical School faculty member, develops scientific visualization software which “explores the unseen human body.” He is also the author of The Architecture and Design of Man and Woman: The Marvel of the Human Body, Revealed. 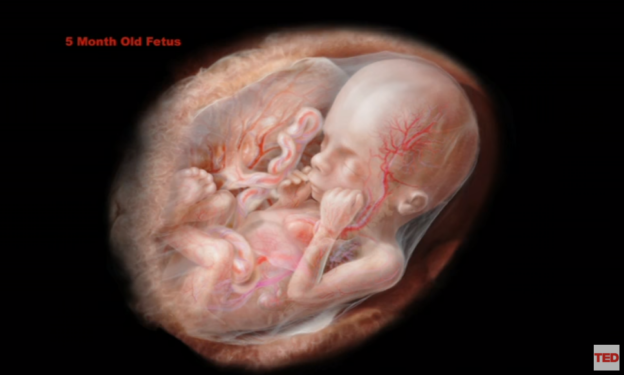 The 2010 talk is highlighted on the Embryo Adoption Awareness Center website. https://www.embryoadoption.org/2014/02/ted-talks-technology-entertainment-design-conception-to-birth-visualized/ As 2019 begins this work of art is worth a second look.